Is honoring someone and respecting them the same thing? What do we mean when we say something is a miracle? Philosophy and Children Philosophy taps children’s natural curiosity and engages them in a search for meaning. In general education, Philosophy for Children is recognized as the leading approach to bringing philosophical inquiry into the classroom. * Based around creating communities of inquiry, participants’ engagement in meaning-making is integrated with deep attention to building reflective, creative and caring community. This makes it particularly relevant to Jewish education. 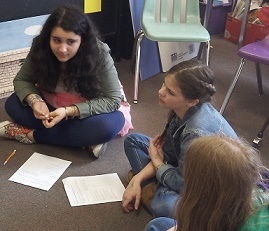 Philosophical Inquiry in Jewish Education combines rigorous exploration of meaning with community building and rich, deep Jewish content knowledge. One of the challenges facing contemporary Jewish life is that of building vibrant communities engaged in the ‘Big Questions’ concerning how we ought to live, both as individuals and communities. Yet figuring out how I ought to live cannot be done in isolation from other people. That is to say, ‘Thinking for myself’ is not a solitary activity – it happens through engaging with the voices of others – both voices of other members of our own communities, and the voices that make up the extended conversation of our traditions ‘over time’ – voices within Jewish and Western culture that we are able to engage with through the written word and through the Arts. In raising our children in the contemporary world we have a responsibility not only to initiate them into a Jewish form of life (Jewish meaning structures, ways of thinking and acting), but also to equip our children with the reasoning tools that will enable them to reflect on the multiple traditions of which they are part as they seek to respond to the question “How ought I live?”. Philosophy for Children not only creates a framework in which these reasoning skills can be strengthened, but it does so through a pedagogy that enables students to think for themselves as a member of a deliberative community. Such deliberation maintains individual autonomy (I must still figure out for myself where I stand on the issues discussed and what I ought to do), but places this thinking within a communal context that recognizes human inter-dependence. A context in which thinking for myself is carried out by thinking with others in a Community of Inquiry. 1. Enables children to encounter Canonical texts as a site for meaning making. 2. Strengthens reasoning skills in a collaborative environment where ‘reasoning’ involves communicating ideas to others and taking responsibility for one’s ideas (for example, taking responsibility for implications that follow on from one’s stance on an issue). 4. Provides students with the opportunity for inquiry into concepts, concerns and meanings that are foundational to Jewish tradition. 6. Engages students with texts that provide the opportunity to explore a range of theological, moral, philosophical, and psychological questions that carry significant meaning for their lives. 8. Develops in students the capacity to make reasonable judgments (the capacity to make reasoned and reasonable decisions regarding the issue at hand).